Susan, aka Suzanne, Stewart and Carly Douglas. A mother and daughter who stole over £20,000 from a 94-year-old resident at a care home where they both worked have been put behind bars. 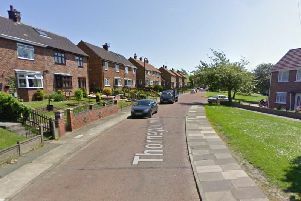 Susan Stewart, 49, and Carly Douglas, 28, ripped off a frail and vulnerable victim, who has since died, and who was in their care at Sycamore Lodge in Sunderland. Stewart, also known as Suzanne, was employed as General Manager of the care home while her daughter, Douglas, worked as a flexi bank carer. Over a four-week period between June and July 2016, the elderly victim had £18,000 stolen from her account via online transfer and almost £3,000 withdrawn at various ATMs. Newcastle Crown Court heard how Douglas had transferred £18,000 into her account via an online transfer. Within 48 hours, she moved £6,000 into her mother's bank account with the reference 'Goose'. Stewart also made 13 cash withdrawals worth £2,991 using the victim’s bank card between June 23 and July 20, 2016. After the victim's bank became suspicious due to the account’s activity and a security block was triggered. The court heard how Douglas then phoned the bank three times, on July 21, pretending to be her elderly victim in an attempt to release the block on the account. But, after failing to answer the security questions, her attempts were unsuccessful. Stewart, of Hemming Street, Sunderland, admitted theft and transferring criminal property and has been jailed for 27 months. Her daughter Douglas, of Offerton Street, Sunderland, admitted theft, transferring criminal property, and fraud by false representation and has been jailed for 30 months. Sam Faulks, prosecuting, told the court how the care home suffered some "reputational damage" as a consequence of the offences. Mr recorder Geoffrey Pritchard told the women, who stood side by side in the dock: "This is an extremely sad and troubling case that involves a very serious, and in my view disturbing, breach of trust, by both defendants, in relation to what was undoubtedly a frail and vulnerable elderly lady who was within their care." The judge said the offences were a "grave abuse of power and trust" and said the victim was "targeted". The judge added: "Albeit in slightly different ways, you both had a high duty of care to look after and protect her interests. "She was particularly vulnerable due to her age, frailty and position at the care centre." After they pleaded guilty, Linda Wrout, Managing Director of Sycamore Care Centre, said: "This was an appalling breach of trust which was carried out under the noses of both residents and employees. "Stewart was a manager who everybody trusted, having been in her role for 12 years, and this meant we were all taken in by her lies and deceit. "She and her daughter, Douglas, have caused enormous distress and upset to everyone who lives and works here. Glenn Gatland, defending Douglas, said: "This is an absolutely tragic case for everybody involved. "It's a tragic case as far as the victim in the case, it's a tragic case for the care home because obviously they have suffered some reputational damage. "But its also a tragic case for the two defendants in the dock. "Carly Douglas suffered badly at the hands of her father. She was in the house when he attempted to set fire to it when they were all in. He had threatened and told them he had dug their graves and he was going to put them in it. And her, as a child, was a witness to that type of behaviour. "It was her mother, co-accused, who tried very hard to protect her from the worst excesses of the father. "She says she's extremely sorry but he felt she had no where else to turn to, nothing else to do. "She of course paid £6000 to her mother as she classed that as the amount of money, she had over many years tried to support her with." Mr Gatland also told the court how she was a sole carer for her five-year-old son. Paul Reid, defending Stewart, said: "This ladies life has been a catalogue of misery. "She's still suffering the effects of losing her mother when she was quite young. "She was one of these battered wives that was too scared to report it to the police. "She is plagued by remorse what she had done for her part in this. "She's a very low risk of offending." Sycamore Care Centre said the pair's actionshad caused 'enormous distress and upset to everyone who lives and works here'.